Spray-on textured ceiling was popular from the 1950s to the 1980s because it was an easy way for builders to hide imperfections. Unfortunately, this was during a period when asbestos was a high-demand building material. 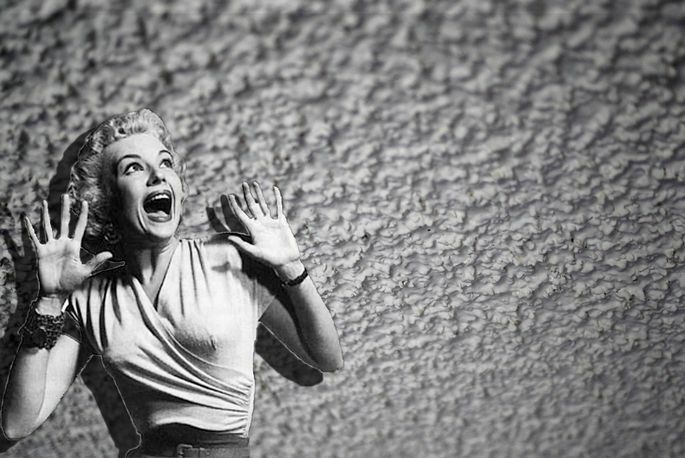 Known as “popcorn ceiling,” or “stucco ceiling,” it was typically 1 to 10 percent asbestos. To find out if your old popcorn ceiling contains asbestos it is best to hire an asbestos abatement professional. So what do you do if you find out your popcorn ceiling contains asbestos? Any percentage of asbestos makes popcorn ceiling dangerous. Although WorkSafeBC’s cut off is 0.5%, it is accurate to say that no amount is safe. Make sure nothing disturbs it, and decide whether you want to have it encapsulated or removed. Removing asbestos popcorn ceiling requires many precautions and is a job best left to qualified professionals. Popcorn ceiling is a friable (or crumbly) material — meaning you can make the fibres airborne while crushing the product with your bare hand. Friable asbestos materials release toxic dust at the slightest disturbance. Inhaling asbestos dust is what can lead to serious diseases such as asbestosis, lung cancer, and mesothelioma. Whether your popcorn ceiling is 1 percent asbestos or 10 percent asbestos, the advice is the same. The ceiling will not endanger your health as long as it remains completely undisturbed or properly encapsulated. In the long run, having it professionally removed is the safest choice. A higher percentage of asbestos is worse, but popcorn ceiling is dangerous even if it is just a few percent asbestos. The Clean Air Act of 1978 banned spray-on asbestos products, which were a major health risk for the workers who applied them. However, the law allowed businesses to use up their existing inventory of products, so asbestos popcorn ceiling was applied well into the 1980s. The crumbliness of popcorn ceiling puts it in a different class than other common asbestos materials leftover in old homes. For example, you can walk on vinyl asbestos floor tiles without much risk. Just don’t smash, scrape or sand them. But merely brushing asbestos popcorn ceiling with your hand releases toxic dust. Do not disturb the ceiling with nails, screws or tape. Don’t put shelves so high that items might scrape the ceiling by accident. Be careful not to scrape the ceiling when moving furniture or long objects. Make sure children do not throw toys or pillows at the ceiling. If a child’s bunkbed allows them to touch the ceiling, don’t put the bunkbed in a room with asbestos popcorn ceiling. If the ceiling starts to peel down because of dampness or age, it must be encapsulated or removed. Encapsulation means covering an asbestos material so it cannot release asbestos dust. Asbestos popcorn ceiling can be covered with new ceiling panels or vinyl paint. One way to cover popcorn ceiling is with gypsum board ceiling panels. This material is like drywall but lighter. You screw it into the framing of the ceiling. It’s best to hire a professional to cover asbestos popcorn ceiling. They will know how to mud and tape the new ceiling seamlessly. Encapsulating asbestos is a safe solution, but if you do renovation or demolition work in the future, the asbestos will become a danger again. If you decide to sell your home, you will have to inform potential buyers of the asbestos you found. Call a pro – handling harmful substances on your own is never the best option when it comes to the health and safety of you and your family. on top of that, insurance policies often do not cover asbestos contamination caused by careless renovations. Trying to remove this yourself could leave you with a huge bill for asbestos abatement as well as unwanted contact with the substance. Are you living in a Nanaimo or Victoria home built before 1990? Contact us if you are concerned about the safety of your home.